In Hawaiian folklore, Pele is vengeful and unpredictable. Her habitation is well known: Kilauea leaves little doubt about where Pele lives. But you never know where she may appear next. She shares this habit with Kilauea. It has a clear summit and all the action stems from there. But where the action will be next is anyone’s guess. Over the years, as for a change she was immovably from the same location, this was forgotten about. But in recent weeks it has become abundantly clear again, as within days she went from a stable-looking dual-eruption site to draining these two completely and turning the magma on distant Puna. It was always changeable. Below, a table of eruptions is reproduced, copied (with minor fixes) from https://www.soest.hawaii.edu/GG/HCV/kil-hist.html of the Hawaii Centre for Volcanology. From 1790 to 1924 there was (perhaps intermittently) a lava lake at the summit. This drained in 1924 with a significant explosion. From 1924 to 1955 there were mainly brief summit eruptions. In 1955 the heavens opened on Puna, and since then most of the activity has been in the eastern rift zone, from 1983 almost continuously at Pu’u’O’o. Since 2008 there was activity both there and at the summit. But over the past years the flow rate from Pu’u’O’o had bene declining, and the lava more rarely reached the ocean. Mid April this year, a blockage developed at Pu’u’O’o and lave began to back up, first inflating the magma reservoir at Pu’u’O’o and later also at Kilauea. On April 30 the rift opened and magma began to flow into the rift. The Pu’u’O’o eruption was abruptly cut off. And on May 5, Puna was hit again, right in the middle of a new housing development that wasn’t there last time Pele came looking. One can argue whether it was a folly to build on a known rift. But in Hawaii, you take your chances. Even Hilo or Kona aren’t safe. One can argue that 1955 was the year of change. This was when Pele became bored with the summit and became infatuated with the eastern rift. Kilauea has shown three basic eruption mode. The touristy one is that of minor but photogenic activity at the summit, as between 1790 and 1955. The awkward one is the rift eruptions, as have been the bane of Hawaii since 1955. And the dangerous one is explosions from the summit. Those appear to have happened in the 200 years or so before 1800, culminating in the disaster of 1790. That year, the summit exploded just as a group of people traveled past. The explosion was the result of a violent intrusion of groundwater. First, there was a thin deposit of wet ash in which the traveler left footprints. Next, the eruption column, which was seen from 90 km away, dropped small stones (lapilli) in it. Finally, the collapsing column, or perhaps a new eruption caused a pyroclastic flow of steam and ash, covering the area west of the summit, with many casualties. It is easy to overlook the explosive nature of the summit. This was the memory that gave Pele such a reputation. But that was all forgotten, and in case, 1790 was before the occupiers came from the west. Puna, in the eastern rift zone had seen no activity since 1840. Apart from an explosive event in 1924, Kilauea had bene well behaved. Mark Twain may have written his famous depiction of Kilauea’s hell, but it was a hell fit for tourists. It was as if Kilauea had forgotten about it, just like the people had forgotten about Kilauea. The area had become a lush rain forest. This was many people’s idea of paradise. The tropical garden would grow anything that could see some soil. I have not had any sweeter pineapple than from this region. Hawaii was never a rich area and paradise can make for a harsh living, but living here must have made it seem worthwhile. The summit had also gone to sleep. But after 18 years of quiescence, there was another summit eruption in 1952. The summit now began to inflate, in spite of a brief eruption in 1954. This was before Pu’u’O’o and the magma had nowhere to go. What happened next is described in considerable detail in an article from USGS. To briefly summarise, small earthquakes began to be measures in Puna in the second half of 1954. There has also been earthquake activity at the summit, but nothing in between. That may seem strange, for how had the magma managed to get from the summit to Puna without disturbing the region in between? The best way to avoid earthquakes is to have the liquid already in situ, as flowing magma does not create earthquakes: that is the shattering of the rocks. In hindsight, the magma had been finding a way long before, perhaps during the 18-year hiatus. The reservoir that 30 years later was going to create Pu’u’O’o was already there. The following video shows the severe health and safety procedures which were in place during the eruption. The eruption paused on March 7. Now activity shifted westward, up-rift, where new fissures opened on what is now west of Leilani. The road here was attacked in images that look eerily similar to 2018. The eruption spread and became vigorous, with fast flows cutting the coastal roads. By April 8 the lava flows had ended, but there were still occasional outbreaks from spatter cones. In May, there were some new flows coming from Ilewa crater which did damage. On May 26, after 24 different vents had erupted with at least four major lava flows, activity abruptly ceased. It left a community shaken and farms and houses destroyed, but no lives were lost. It did change behaviours and beliefs: the number of food offerings made to Pele greatly increased during and after the eruption, although in a sign of cultural change, the traditional gifts of breadfruit, bananas, pork and tobacco were now often presented in Christmas wrappings. USGS mentions that the early 1955 lava was unusually differentiated, suggesting it had been in local storage for a considerable time. Kilauea only ever produces basalt, with MgO ranging from a low of 7% to a maximum of 20%. But the early 1955 magma had MgO as low as 5%, a sign of crystallization over time. Had it been in local storage since 1840, perhaps? This is similar to the current eruption which so far has pushed out old magma. The old material must have cooled considerably over time, but apparently was reheated by the new magma. The opening rift pushed out the old material, but also turned it back into eruptable magma. Perhaps this had begun in mid 1954, and as the old magma slow re-melted, it opened the rift. It must have been a slow process, and perhaps with modern instrumentation HVO could have seen it happening. Later in the eruption the new magma arrived from the summit, and this was also shown by the deflation at Kilauea. Whether the change in lava composition is because of mixing with the new magma, or because of stratification in the local storage, remains hotly disputed. So Puna is not just a recipient of magma that is pushed down the rift. It has its own storage underground. Drilling at the Puna geothermal plant has even found dacitic magma, at a depth of 2.5 km, which had differentiated (and cooled) even longer. Kilauean magmas can only produce a few per cent dacitic magma, so by the time this has happened there is very little magma left. But there are things happening underground and Puna is far from passive. The eastern rift extends beyond the coast, and at times has erupted directly into the ocean. The lavas here show a range of compositions, also with evidence for storage in the rift zone. How long had the magma been in storage? This has been studied with radioactive trace elements, thorium and radon. With surprising conclusions. The magma had not been left by the 1840 eruption. The minimum storage time was 550 years! And it may have been as long as 2500 years. It seems that the 1955 eruption was based on events that pre-dated even the Hawaiian’s occupation of the island. Pele had been waiting for them. The trigger came from the summit, but the ammunition had been made ready longe before. Sp how about the current eruption? When it is sated to have pushed out 1955 lavas, which lavas do they mean? And why is this such a wimpy eruption compared to 60 years ago? The lava that is pushed is likely a mixture, as that is what 1955 produced. Interesting is that the current eruption was focussed on Leilani, which is exactly the area skipped in 1955. In a way, this was the region where 1955 was never finished. But why is there so little vigour? It is a good thing for the local population, apart from those people who still have lost their homes, through no fault of their own. The Earth too does terror. The difference with 1955 is up-rift. Pu’u’O’o has been providing the east rift zone with a safety valve for the past 30 years. The pressure in the rift never build up, and presumably it has only been in the past year or so that any flow-through to the eastern rift restarted. The current eruption is running on fumes. The Kilauea summit reservoir is replenishing the rift and adding new pressure, but whether this is enough remains to be seen. 2018 is not 1995. We have television, mobile phones, youtube – it is different world. And Kilauea has developed a safety habit. But now, whilst the world seems to be returning to intolerance, Kilauea may be changing. Puna perhaps is petering out – but Kilauea could be starting a new era of explosions. Time will tell. 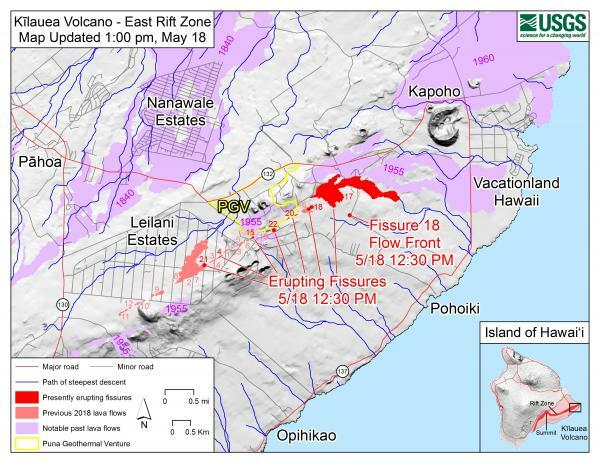 ← Kilauea – Slump or Slide? Do we see the new pu u o’o in the making here? And if so what will it be called…. Does anyone know which fissure this is ? 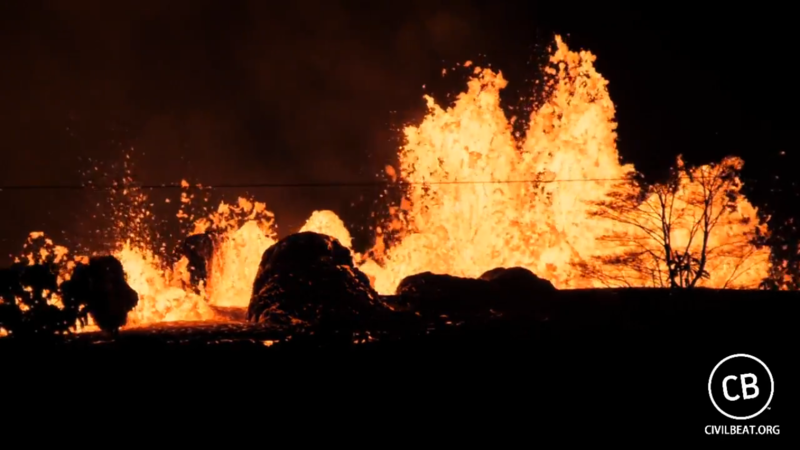 Its a live feed and the lava fountain is really high now and so loud. Think it is fissure 22. I don’t think so, he mentioned that there was activity over at 22 and that he might go film it later. In fact, he panned around to point at 22, it’s roughly behind him. I think the high one is 17, but they are panning around. Thanks for the confirmation how the house with the green roof is still standing is a miracle. Satelite Images of the summit lava lake taken before and after the recent eruptions. It seems the lake grew quite a bit. Overlook is only a large vent in a larger crater. With the way things are going, in a year or so the entire Hale’uma’u crater might be open again. I’m looking forward to it. Sorry! I was so excited by the possibility of a remodeled crater that I forgot a syllable. It looks like activity at 17 has picked up again and it is shooting straight up. rescued from our resident troll guard, don’t worry, he’s been told off and shouldn’t bother you any more! Depends on what it is talking about. If it’s a restriction based on Parental controls, you might have to do so to view what you are trying to see. If it’s something other than that, I wouldn’t trust some arcane message that pops up. It’s listed as an explosion, Mag 2.6. That works out to about 108 kg of TNT. Via Gurgle Urt, it shows up as on a road outside of town. Another LNG powered trash truck go off? Which seems to be the biggest thing in town. The position pinned by USGS is few km from where the open cast mine is situated, could be just normal uncertainty in EQ locating – or perhaps they’re blowing something else up, starting a new mine etc not yet visible in satellite photos. I expect they use ANFO not TNT. I don’t have any relationship data between ANFO and TNT… but ANFO being a tertiary explosive, depends a lot on what is used for a booster and how it’s mixed/confined. The guy with the rooster nearby is here. Rooster has been quiet for about an hour. Well… nothing really odd is going on. Fountain near that house is about 400 feet tall, the magma river is still behind the trees, the magma pond near that is less energetic, and fissure 22 is still to the rear of him. Oh, and some twit in the chat wanted to call fissure 17 “Carrie” as in Carrie Fissure. I think “ströndinni sprunga” would be better if we were naming it… but, I defer to the actual Scandinavians for that one. Side note: The Videographer has noted that he needs to change batteries soon. Also he’s using a sock on the microphone to cut down on wind noise. Edit add: He’s preparing to pull the feed and is gonna take a nap. Said he will be back online this evening. Sorry I am the one who name the tree after Pliny. So the tree is piny the younger. This was when the stream was on volcanoYT, I think Sunday or Monday. So it is sheep related after all. When the streams split I continued to refer to Piney and it sort of took off as quite a few caught the pun. There have been a few times where the fountain and the pine tree have the same silhouette. While he seem to be describing the ash cloud looking like a pine tree, I wonder now if he also might have seen some of the fissures. Normally I lurk, but a good eruption gets the sheep out. Different commercial, but in the same vein. Looks like a radar image. Makes sense, as radar can penetrate clouds and also volcanic fumes and ash clouds. It already looks very interesting – not only has Overlook Crater grown, but there’s also a subsidence feature on the right side of Halema’uma’u. Maybe it could collapse further to form a new extension of Halema’uma’u? Sorry, posted in the wrong spot – that was meant as a direct reply to the radar image of Kilauea Caldera posted by Magma Shard. It’s a bit hard to see, but at 0:23 seconds it looks like it made it into the ocean? That’s not ocean. That’s the lava field from fissure 17. The ocean is at least 1.5-2 miles from the nearest flow. No it hasnt made it to the ocean yet, not actually that close at all yet but with the speed of these flows I think that will change soon… These flows are open glowing lava rivers like the ones in 1955 and in 1983, and given that one of the pu’u o’o 1984 flows went 14 km in less than a day to end near kalapana is an indication of how fast things can happen. So the house Brandon is filming from would be somewhere in the lower right of this picture? My understanding it is the house next to the cell tower. Wasted too much time attempting to find that stupid pine tree on google earth. And it is live again here. The Honolulu Civil Beat feed. Geothermal plant (PGV) comms outbuilding and tower has been taken out by lava. Another outbuilding of PGV about to go according to Hawaii News Now. 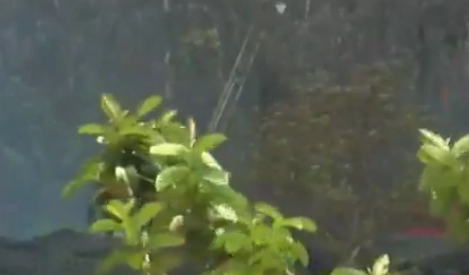 You can just make out the leaning (to the right) antenna tower about the top centre of this screenshot from Hawaii News Now report. Looks like our guardian is being rather picky tonight, sending lots into the dungeon. We’re monitoring as best as we can, but apologies if you have a timeout. Thanks for reminding me. I have a batch of chipotle I need to go pull out of the smoker and grind. This batch uses habanero as the source pepper. Poblano is nice, but not hot at all. I also have a tray of Serrano made up. I think this says it all… New ocean entry in a day or so basically guaranteed if this keeps it up. Deflation at the Kilauea GPS has more or less ended. The recent quakes may have plugged the leak. This is the latest HVO map indicating which fissures are now active. You would expect that the activity will become more focussed on fewer fissions. At the moment it is a bit of a scatter approach, erupting over a large stretch. Later in the eruption there might be some re-activation of the fissures on the western end. What is the volume of magma that has drained, presumably mostly into the East Rift Zone, from the higher levels of Kilauea? What is the volume of magma that has erupted from the East Rift Zone to this point? How much magma, on a daily basis, did it take to keep Puʻu ʻŌʻō erupting for 30 or so years? Do you think that the conduit is now open into the East Rift Zone? How long do you think that this new location of the eruption of Kilauea will go on? Im not sure how much magma exactly would have drained out of the summit, but the volume of the 1960 eruption was about 0.1 km3, and the amount of deflation that has happened at the summit in the past week is about 3 times what was in 1960, so I guess the total amount of magma available for this eruption would be about 3 times that of what was available in 1960, so the total amount of magma that could erupt is about 0.3 km3. Probably there was at least as much magma left underground in 1960 as what erupted, so the total amount of magma drained out of the summit could be over 0.5 km3 of magma (a lot of the current intrusion was from under the area uprift of pu’u o’o so not all of it was summit derived). Yep, all we can do is speculate and watch. I was watching the live feed this morning and noticed that the lava fountain went from thin fluid and small projectiles to the thicker sticker blocks. Then it went back to the hotter lava and small projectiles again after about 5 minutes. I was at work and got interrupted(by work) or I would have tried to record and compare. I’m thinking that the magma is still mixing. I think that while fissure 17 has the highest fountain, fissure 16 and 20 are erupting most of the lava. They are out of view to the right and their lava is flowing a bit out of view to the right too. I did go through the numbers for Kilauea and calculated that about 0.03 km3 may have left its magma chamber. The total magma reservoir under Kilauea may hold 2-3 km3, so only about 1% of that drained out. Pu’u’O’o will have added to that but not all that much. However, there was a significant reservoir a bit up-rift from Pu’u’O’o which may inflate the numbers. Effectively, this eruption is fuelled by the fact that Pu’u’O’o over some years has been erupting less than it received. 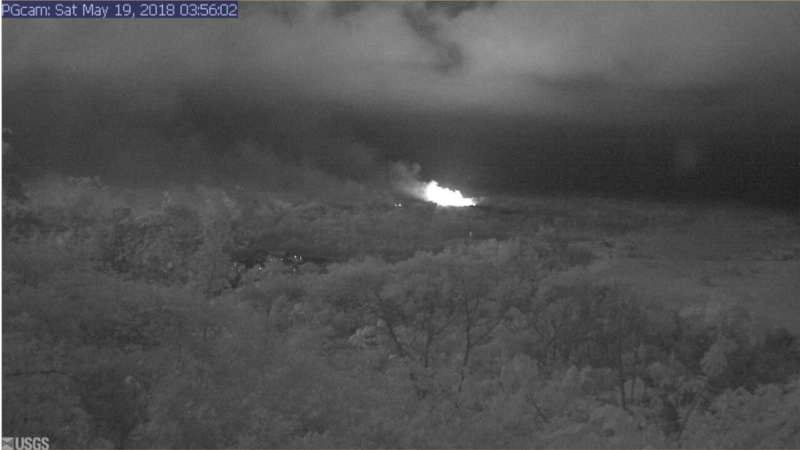 So far, very little has erupted in Puna. But if you compare to Pu’u’O’o, that erupted on average over 30 years around 0.1-0.2 km3 per year. So the amount of magma drained out of the summit will keep a similar eruption going for 1-2 months. The volume of Kilauea’s eruptions tends to get more the longer the mountain has been quiet. That would suggest this eruption won’t be that large. Nice lava fountain now. Low, but intense lava river. The eruption is becoming more effusive. If a cone builds, the height of the fountain decrease as the lake in the cone gets larger. It is harder to judge whether the volume has decreased or not. I cannot figure out what I am seeing. It looks like a fissure in the middle of a lava river. What is it really? In the beginning I was stupid enough to believe that I had it all figured out. I was even telling the guys from the live stream in the chat that it was 17, not 18 (and I thought later, it was 18, but now I’m not sure that it wasn’t 17 all along). Of course I was wrong since everybody is wrong, all the time. The devil didn’t create the volcanos, he (or she) created the numbers? Perhaps. Its still going like that but way higher now… This flow will be in the ocean by this time tomorrow at the rate things are going. Hawaii News Now has announced that fast moving lava flow is poised to cut off a road which means 40 homes will be isolated. Shelter in place and wait to be rescued. Helicopters can be heard on the livestream. Pohoiki road, still much closer to Leilani than to the ocean. The road that is being cut-off is towards the forest with some isolated lots and dwellings. There shouldn’t have been any in the area any more, but it must be hard to leave everything you won behind! The location mentioned on Hawaii News (http://www.hawaiinewsnow.com/story/38186017/new-fissure-opens-in-lower-puna-while-others-still-spewing-lava) is indicated by the googly symbol. I was wondering where this lava would have come from. most likely fissure 16, i think. For them that be looking. WXChasing isn’t broadcasting as far as I can tell. Civil Beat seems to have abandoned their post with the camera running. My guess is that Brandon (WXChasing) has also left. I spoke too soon. Civil beat is back operating the camera. it says lava from an unknown source crossed the road. Fissure 17 is reminding me so much about the early days of Pu’u O’o at the moment. Let’s hope it isn’t! The last thing Puna will want is an eruption lasting 30 years.. I was thinking mostly of how it started building up the young cone, rivers of lava flowing away from it and also the fountaining gaining more height over time. Makes sense, I guess, it’s the same process after all. The difference is that the fountains at pu’u o’o in its early days were less continuous than this. I doubt a long lasting eruption like pu’u o’o or even like mauna ulu would be possible in this area because both eruptions have left “big” collapse craters behind which seem to be common in the middle rift and summit area but are lacking in the lower rift. It also makes sense that long lasting eruptions would be close to the summit and have some kind of small magma chambers associated because this would favour a more stable continued supply. (a more stable one than a long thin dyke). Dunno about the lack of collapse structures for lower Puna. I think they are proposing a different mechanism for the formation of those craters, it describes something more similar to a lava tube collapse and I dont think that or anything close to it could produce collapses as big as the one we have seen at pu’u o’o. Does anyone have a link to a map showing the area covered by the main lava flows and the latest location of the lava flow fronts? Hmm. Into the dungeon on the wrong email address. Try the other. Does anyone have a link to a recent map showing the area covered by the main lava flows and the latest position of the lava flow fronts? I thought I saw one on here posted by Albert earlier. Can’t really zip around to look, I’m on a phone now. Thanks Lurk. Thought there might be something a bit later than that one. Not to worry. Found I can export this one to Google Earth and it updates itself, so I’ll wind up with the most recent version of it in due course. For anyone wanting to export the map to Google Earth – click on the three little red dots on the right of the red bar at the top left of the map and select Download KML. Its interesting that the overall fissure cuts through the elevation that normally makes the lava flow south. If enough fissures on the west activate we could potentially see a serious flow going north and the east aswell. So, the eruption started in 1983 is finally over? Depends on your point of view. The Pu’u o’o bit is kaput, but the magma is in the rift, and is bopping along quite well. Technically there wasnt really a gap between this starting and pu’u o’o ending. What would probably be correct is to say the pu’u o’o eruption ended, but the state of continuous eruption that started in 1983 continues… It technically might not even end with this, depending on how long this goes for the summit might start inflating and lava could well into the overlook again before this activity ends, and then keep erupting… 😉 That probably wont happen though. While watching the live streams, if you time how long it takes a dollop of magma to fall from its apex to the ground, you can get an estimate of the fountain height. Neat tool. Where do I buy a helmet that will protect me from a dollop of magma falling from 176 metres at a speed of 211 km/hour? Use the available 6 seconds to walk 12 metres to a safer location at 2 metres per second or run 24 metres at 4 metres per second? s = ut + 0.5at^2 takes me (and all of you, no doubt) back a bit. I would guess that the heights would be over-estimated a little just using the falling time of a blob of magma though, because the given equations are for free-fall in a vacuum, and there is air resistance of course. Over the last 30 some odd years, we’ve watched the magma pools rise and fall… they always had hot magma feeding them. Now that a lower pond(s) is/are forming, what indication do we have that overall activity is slowing? This could become a very persistant feature of the system… until overall activity wanes. I somewhat disagree with the comment Albert made before that this eruption will be relatively small, there is really no conceivable way that this will be a small eruption when enough magma has drained out of the summit to cause a collapse and lower the uwekahuna vault by almost a meter. in 1960 there was a minor collapse of halemaumau but nothing like this last week, and the deformation was about 30 cm of deflation. If 1960 was about 3 times smaller with its effect on the summit, but still managed to be kilaueas 4th biggest historical eruption (0.1 km3) then I dont really think the future is looking great for the next few months… 3 times the deformation should be roughly 3 times the potential eruption size. 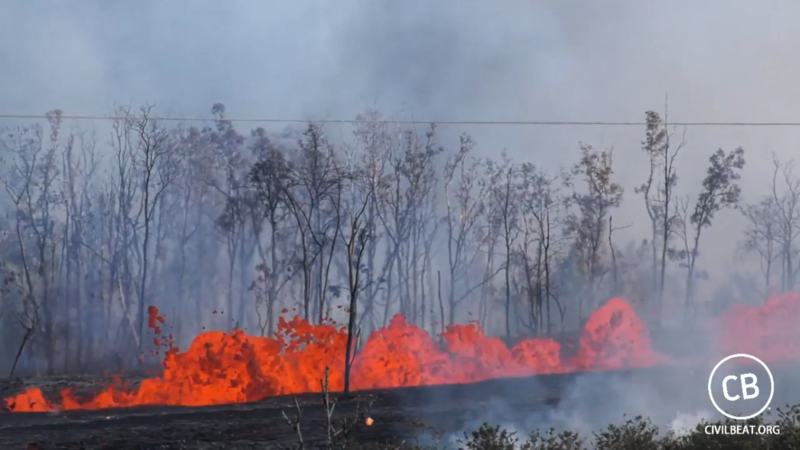 This will go down in the history records as much more than just the first eruption to happen in an inhabited area, it could be one of kilaueas biggest eruptions. On the the map of the East Rift Zone that Lurk posted above, you see blue lines that look like rivers, but these are demarcating the lowest points, that is, the path lava would most likely follow. That would give an indication to what zones might be endangered if the lava decides to flow to the other side of the rift zone. i think some of the far west fissures in leilani are reactivating, there is a bit of glow there going up to the top fissure near pu’u kaliu. I wonder if the fissure is unzipping and it started at the easternmost vents and is going uphill. I guess there is a chance of the hwy 130 cracks and steaming areas erupting in a few days, which would be very interesting. Travis Sanders has posted that Pohoiki boat ramp / Isaac Hale Beach Park are in danger. May 18th 11pm. Lava over half way there. The PGcam is bright as the full moon at the moment, there must be some rather impressive fountaining going on at the moment. Only too bad the camera is not facing East. Is anyone streaming fissure 17 at the moment? Honolulu Civil Beat on youtube, they are looking at a new fissure west of fissure 17, I think it is either 20 or 22. I dont know how big the fountain at 17 is but im assuming it hasnt changed much or they would be looking at it. The eruption rate at the fissure they are looking at is enormous just by looking at the flow. The glow in the webcam could be a light that was put there maybe? The glow has grown and faded quite a bit over the last few frames, so I’m pretty sure it’s related to either the lava or something that it has set alight. 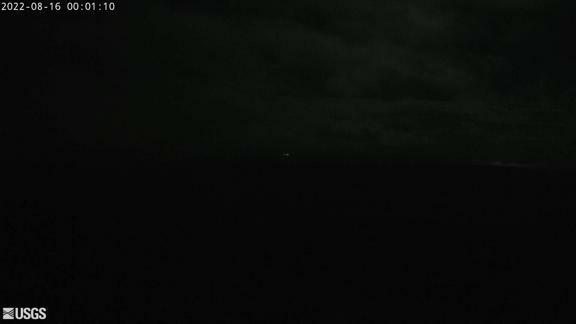 The other nights, the camera has been showing pitch blackness except for where the lights and fissures are. Checking the usual sources to see if I can find any clues. If it is something interesting, I’ll report back here. Then I’d say that the PGcam glow is most likely glow from the erupting fissures being reflected and diffused from the clouds of vog. The varying intensity of the glow seen would depend on the direction the vog is drifting at the moment. 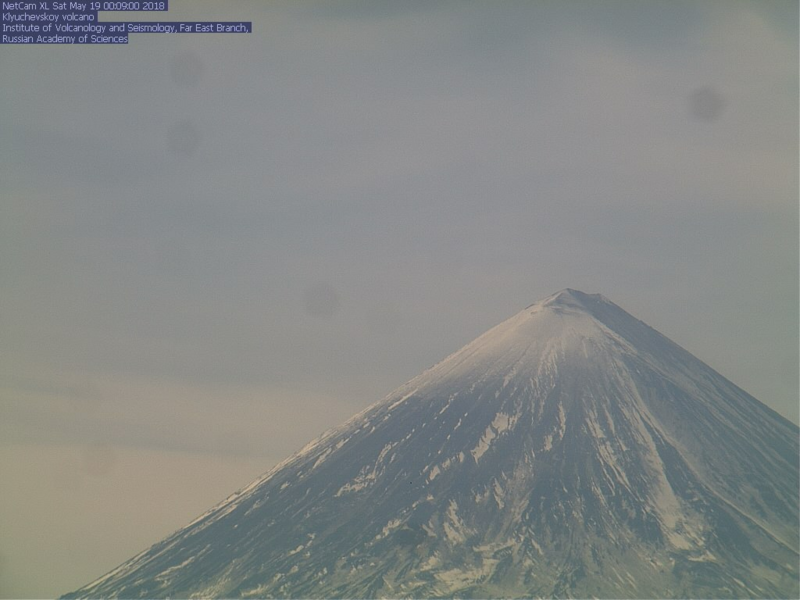 Its probably not from a fountain but from the huge area being covered by active lava flows right now, the lava is already at least half way to the sea and that is from an update 4 hours ago. There have been reports of an eruption of ash, so most likely a rockfall into the pit. HVO reports ash to 3 kilometer height at Halemaumau. Also, “A fast-moving pahoehoe lava flow that emerged from fissure 20 this afternoon continues to flow southeast. The flow has three main lobes. The easternmost is east of Pohoiki Road and is moving about 230 yards per hour. The westernmost of the lobes is near Malamaki Road and is moving at about 40 yards per hour.” I don’t know where that road is but would guess inside the Malama-ki forest? At that rate the east flow might reach the coast within 7 hours. 18:30 UTC or 09:30 local time. That would be at about 4:30 in the morning where I am, so I’l miss it unless it slows down a bit. I hope at least there is someone at the ocean or on a boat to record it. Latest civil beat screenshot from right now. Reminds me now of the Bardarbunga eruption. 🙂 Stayed there for a long time. We need volunteers to place three GPS stations equipped with solar panels with ash wiper blades down on the caldera floor. I just can’t quite fully trust those rim-relative tiltmeters. Are they saying that the rim is popping back up periodically after blasts? But why? As for “Why?” from above → recoil/rebound. Pressure from the explosions extend the crater (which shallows the tilt) followed by slow relaxation as the rock move back in. The tilt measurement is real!